Hastings was just 33 when he died, but had already made his mark in the world of mass communication. After cutting his journalist teeth on Newsweek, beginning as an unpaid intern, he went on to write for Rolling Stone < em>, and BuzzFeed, among others. His 2010 in-depth profile of Stanley McChrystal led to the end of the NATO commander’s military career and earned Hastings the coveted George Pollack Award. 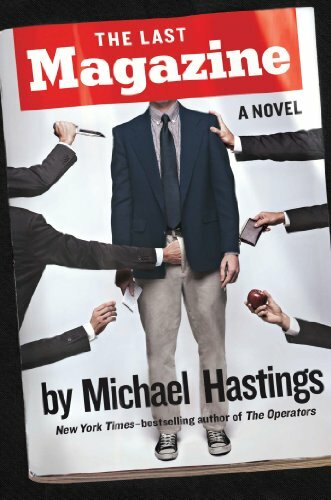 Hastings later wrote his month-long sojourn with McChrystal into his second book, The Operators. After his death, Hastings was awarded the Norman Mailer Award for Emerging Journalist. Perhaps it was Hastings’s uncompromising, no-holds-barred style of reporting that made him into the compelling writer that he was, and it is this style that sweeps you up in his posthumous novel, The Last Magazine, and does not let you go. The Last Magazine is a breezy, gonzo-style roman a clef and a thinly-veiled description of the teetering, fast-changing world of journalism. It focuses on the majestic failure of Newsweek, once as permanent a fixture in American culture as apple pie, baseball, and fireworks on the Fourth of July. I’ll bet there isn’t an American journalist walking this earth who didn’t rush to read the scoop when The Last Magazine was published. I know I did, with a greedy interest to look in the mirror at myself and the people I worked with in foreign journalism for more than a decade. But it’s also a novel that will appeal to anyone interested in why print journalism has taken such a fall. The novel centers on a fledgling writer (not surprisingly called Michael M. Hastings) — raised on the Holocaust, Hunter S. Thompson, and Mountain Dew — who spends much of his time closeted in a cubicle fact-checking other people’s stories like those before him. Against the events of the War in Iraq, we are introduced to the coke-sniffing A.E. Peoria, star foreign correspondent. He becomes a pawn in the hands of the suited executives back in New York and crashes into oblivion, all under the watchful eyes of the young Hastings, who befriends him in order to learn what makes Peoria tick. “What’s the readership of your dead tree?” Grove asks. “I think they say it’s like twenty million readership, three million circulation,” I say. “We definitely use a lot of paper,” I say. A couple of weeks before he died, Mike Hastings emailed me. “Hi Joanna,” he wrote. “It’s been waaaay too long!” He wanted to know if I could help with information on Israelis in senior security positions who may have had connections with CIA director John Brennan, who was in Jerusalem at the time. It was for a profile that Hastings was intending to write. It would have been controversial, no doubt, and I am sure Mike Hastings was putting his everything into researching it. We emailed briefly. He said he would be in touch. That was the last time I ever heard from him. Joanna Chen is a journalist, poet, and literary translator. Her work has been published in The Los Angeles Review of Books, Newsweek, The Daily Beast, Poet Lore, Cactus Heart, and Word Riot. Joanna is online at joannachen.com and on Twitter @joannachen1. The coveted George Polk Award, maybe? I think it’s fairly safe to say that it was “re-worked”. These tales are harder than the grotesques of Gogol. Borges, too, you suspect, is up to something relatively straightforward compared to Krzhizhanovsky.